We are studying for Titi’s midterm in American History at our booth in McDonald’s. The course is in Spanish, so Titi—my thirteen-year-old God Daughter—has to translate questions in her class workbook for me so I can look them up in the hefty English version I got online that must weigh about five pounds. It is called The American Journey, Florida Edition, by Appleby, Brinkley, and McPherson. (I have come to think of the authors as “the three gringos.” I am the fourth.) What we have to cover for tomorrow’s test is simply American history from Cristobal Colon and Ponce de Leon to the end of the Revolutionary War. “Is that like in Iraq?” Titi asks. 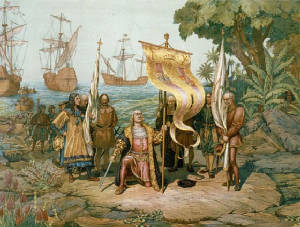 Christopher Columbus illustration for Prang Education Books in 1893. That takes care of the Indians. We need to press on to Bunker Hill, The Boston Tea Party, The Boston Massacre, Valley Forge, and George Washington crossing the Delaware. “What about ‘The Green Mountain Boys?” she asks. I like to say it, since it’s probably one of the few events in American history I am able to say in Spanish. I have to look it up, so I heave the history tome up to my lap, scan the index, and turn to the pages cited. 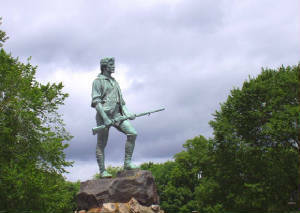 The Minute Man Statue stands in Lexington, MA. The book gives no further explanation of who Ethan Allen was or who his “Boys” were. All I can contribute is that Allen and his boys were from Vermont, which is called “The Green Mountain State” and that must be how they got their name. We both are at a loss as to why “The Boys” are so important to Miss Garcia-Ibarra. Anyway, we’ve nailed them; they captured a fort. Hitting on all the high points—at least most of the people and events in boldface—takes us until 7:30. We’ve been at the books for three hours, fueled by several orders of “apple dippers” and Titi’s standard meal—a cheeseburger, catsup only—when we finally pack up and return to the house. Abuela is sitting on the couch with little Rey beside her. Little Rey (spelled “R-e-y” as in Spanish for “King”), is twelve years old but he will never walk or talk. When he was a year old he was diagnosed as “hypotonic,” more commonly called “floppy baby,” and meaning “lack of muscle tone.” He can crawl and make sounds, laugh and cry, but that is all. Little Rey has been sick with a bad cold for about a week now. At least he is sitting up, rather than leaning his head down in front of him like he has been. Alina, the mother of Titi and Little Rey, is standing in front of the couch, talking to Abuela. I heft up the American History tome and Titi holds up the notebook she’s been writing in to show Abuela “proof” that we’ve been working, studying for tomorrow’s test. Abuela looks, smiles, nods, gives us “Ahhhs” of approval, and adds “Yes, yes!” She hands the notes to Alina, and I display the book, but Alina brushes them aside, turning to her daughter. Alina turns and clicks out of the room in her high-heeled boots. I know I can’t say anything. It won’t help. I look at Abuela, and little Rey, and Titi, and no one moves or speaks. The fury I feel freezes me; my mind seems wiped to a blank slate. All I know is I don’t want Titi to get a cold, especially now, when she has her midterms all week, starting tomorrow. Without thought, I bend down and pick up little Rey. I haven’t lifted or carried him since he was six years old. He is twice as old now, and even though his arms and legs are as thin as strings, he must weigh at least twice as much as he did since the days when I used to carry him around the yard. I am one triple-by-pass and one new heart valve older, but I manage to hoist him up and get his legs under my arms to carry him. I start toward his mattress room, and take a step, then another. All at once I feel my legs about to fold as I tilt toward the big TV on the living room table, little Rey in my arms. I am wordless with fear as my body fights the falling; everything I am is in the trembling effort to stay upright, and in that hung moment Titi calls “Danny!” and the weight is lifted as Abuela is beside me and takes the boy from my arms. For a moment it feels I am still in the fall, the blank TV screen blurring before me, and I think I may be sick. It seems a wonder I can stand, and when I do, I go carefully to the couch and sit, and we all start talking at once. The nausea passes but the fear takes a longer time to subside, and my hands grip the steering wheel hard as I start back home. As I cross over the McArthur Causeway to Miami Beach, I wonder how I will ever make George Washington—much less The Green Mountain Boys—seem relevant to a teenager whose parents came here from Cuba on the Mariel Boat Lift. The next time Titi asks me why she needs to learn about stuff that happened in the past, when we’re living right now, I am ready with the answer. I say if it weren’t for George Washington and his troops surviving that brutal winter at Valley Forge and beating the British to make us a free country (Unit Three, Chapter Six) her family might not have been able to come here, and she wouldn’t be here. “But I am here,” she says. I sigh, and flip ahead. We move on, to The Frontier. Dan Wakefield is a novelist, journalist, and screenwriter, whose memoirs include Returning: A Spiritual Journey, and New York in the Fifties. This memoir piece is excerpted from his current book in progress. He is Writer in Residence at Florida International University. Visit his webpage.